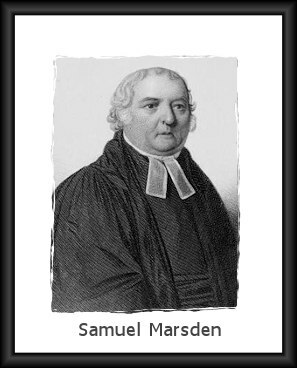 Samuel Marsden (1765?-1838) was an English missionary to New South Wales, Australia, where he began serving as chaplain to convicts in a penal colony in 1794; and to New Zealand where he was the first to present the gospel to the Maoris in 1814. He returned to England once in 1807-1808. Samuel Marsden. Bearer of Good Tidings in New Zealand and New South Wales. Samuel Marsden. Apostle of New Zealand. Samuel Marsden: New Zealand, 1814-1838. Samuel Marsden, the Australian Chaplain and Friend of the Maori. Samuel Marsden in New Zealand. Samuel Marsden, Pioneer to Maoris. Samuel Marsden: Chronology of Life. Elizabeth Fristan Marsden (1772-1835): Born in Hull, England in July, 1772, Elizabeth married Samuel Marsden April 21, 1793. Their first child, Anne, was born 1794, on the ship, William, as the Marden's sailed to New South Wales, Australia. They were married for over 42 years and had eight children: Anne, Charles Simeon (died age 3), Elizabeth, John, Charles Simeon, Mary, Jane, and Martha. Mrs. Marsden died October 2, 1835 in Parramatta, NSW.